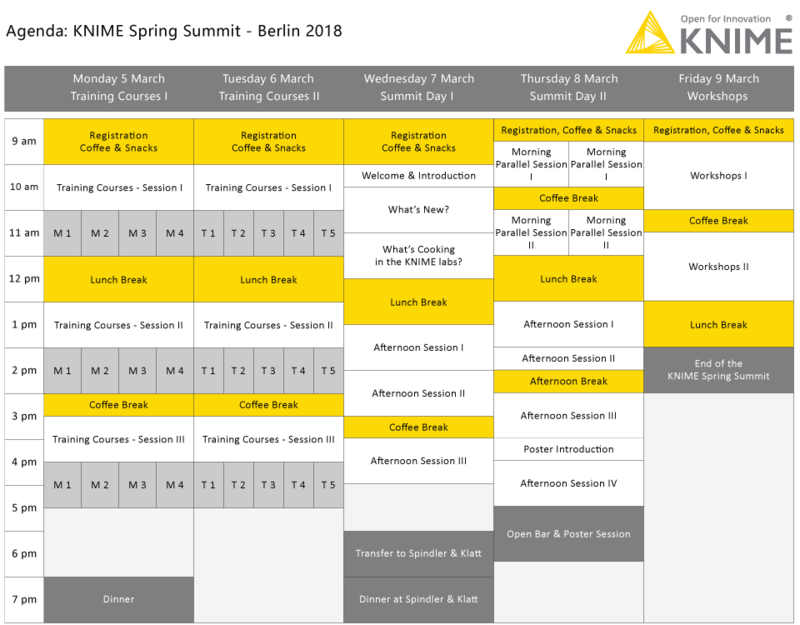 Join us and other KNIME users for the 11th KNIME Spring Summit at Hotel Berlin, Berlin from March 5 - 9, 2018. Leading data scientists will be there to share how they use KNIME software for solving complex data problems across a variety of fields. We have an agenda filled with training courses, Summit sessions, and workshops with presenters from various companies, KNIME community members, our customers, and of course our very own KNIME team. Please use the Summit registration form below to register for one or two of these courses. Tuesday, March 6, 1pm - 3:30pm: Node Development Crash Course. In this session we will show you everything you need to know in order to write your own nodes. Based on a simple KNIME node we will show you what classes are required and what methods must be implemented. All participants should know how to program Java and ideally also how to use the Eclipse SDK. Please bring your own computer with a current installation of Eclipse SDK. These sessions will be held in the Berlin-Montreal room. Please indicate if you’ll be attending when completing your summit registration. In cooperation with OpenMS from the University of Tübingen, SeqAn from the FU Berlin and PIA from the University of Bochum, this workshop will provide a brief introduction to the analysis of mass spectrometry and sequence data within KNIME. After a short introduction to each of the frameworks/tools and the underlying Generic KNIME Node creation, we will demonstrate how to utilize the tools provided by the corresponding KNIME plugins in order to build workflows that retrieve and analyze common life science data and use standard KNIME nodes to statistically analyze the results. The capabilities of the plugins will be shown on two workflows - one for label-free quantification of proteins and another for metagenomic profiling. The workflows will make use of recent developments in the deNBI-CIBI plugin including the new Docker export functionality. This workshop is recommended for users who are familiar with KNIME and who would like to learn more about using OpenMS, SeqAn and PIA to process data from life-sciences. This workshop will describe why Random Forests and Gradient Boosted Trees are so much more accurate than individual decision trees or even other ensemble approaches (such as Bagging). We will also look at examples of how to build them in KNIME, and provide practical warnings of how they can fail. The KNIME Big Data Workshop is designed to show you solutions for the three Vs of Big Data: Variety, Volume, and Velocity. The workshop will discuss the KNIME Big Data Connectors and in-database processing, advanced analytics powered by Apache Spark and MLlib with the KNIME Extension for Apache Spark, distributed and parallel execution of workflows. We will also discuss high performance scoring services on deployed models based on REST interfaces. After participating in this interactive workshop you'll be able to create your own guided analytics workflows, understand how to use them in KNIME Analytics Platform, and deploy them using the KNIME WebPortal. We'll do this "Learnathon" style which means after a brief introduction to the nodes and techniques used to create guided analytics workflows in KNIME, you will work in small teams to build real workflows. We'll provide some sample use cases for you to work on. This workshop is targeted at people who already have some KNIME expertise. You don’t need to be an expert, but you'll get more out of it if you aren’t a complete beginner. We plan on working with life science datasets but domain knowledge isn't required for the workshop - you'll be fine if you know KNIME. In the KNIME Deep Learning Workshop we will demonstrate the new KNIME Deep Learning capabilities, which were released with KNIME Analytics Platform 3.5. We will discuss how to create, fine-tune, and extend new or existing Keras models in KNIME Analytics Platform to solve a variety of analysis problems such as image or text classification and time-series analysis. The 3D-e-Chem KNIME nodes enable the integration of cheminformatics and bioinformatics tools for the analysis of structural protein-ligand interaction data and the design of flexible computer-aided drug design workflows. New chemical and biological data analytics tools and workflows have been developed that complement existing cheminformatics KNIME nodes to facilitate the efficient exploitation of structural and pharmacological protein-ligand interaction data from proteome-wide databases (e.g. ChEMBLdb and PDB), as well as customized information systems focused on e.g. G Protein-Coupled Receptors (GPCRdb) and protein kinases (KLIFS). The 3D-e-Chem KNIME node toolbox provides building blocks for the design of new approaches in i) structure-based bioactivity data mapping, ii) structure-based identification of scaffold replacement strategies for ligand design (PLANTS), iii) ligand-based target prediction (SEA/OCEAN), iv) protein sequence-based binding site identification and ligand repurposing (ss-TEA), and v) structure-based pharmacophore comparison for ligand repurposing across protein families (KRIPO/ Silicos-it). Preconfigured workflows facilitate the efficient use of these 3D-e-Chem tools. The 3D-e-Chem session will provide a hands-on tutorial on the different tools and example workflows, and will offer participants the possibility to work on the design of their own computer-aided drug discovery workflows. Floating through clouds of words, sailing down rivers of topics, entangled in networks of terms. In this workshop we will demonstrate various ways of visualizing unstructured textual data. The KNIME Image Processing Workshop provides a brief introduction into the analysis of images with KNIME Image Processing. We will walk through several use cases from various fields including BioImage Analysis and Classification with Deep Learning, Car Counting, and more. We will also provide a short overview of our current and future work. The workshop is recommended for users who are familiar with KNIME Analytics Platform and would like to learn more about KNIME Image Processing. In the KNIME Server Workshop you’ll learn how to get the most out of KNIME Server. Learn how to effectively share workflows, data, and metanodes with colleagues, offload computationally intensive tasks to dedicated hardware, schedule tasks to run automatically,. You'll also learn about server administration managed by KNIME, and deploying analytics generated with KNIME Analytics Platform to end-users with KNIME WebPortal and KNIME Server REST API. The Spring Summit will once again be held at Hotel Berlin, Berlin. They have a contingent of rooms reserved for attendees. When you reserve a room, please use this link for the group “KNIME SPRING SUMMIT 2018” to benefit from the special Summit rate which ensures you a Superior room, including breakfast. We advise booking your room early! This workshop targets software developers with backgrounds in ChemInformatics and Java, who think about participating in RDKit Nodes Development. Information about this course can be found here.